I don’t know about you but trying to fit in healthy meals for the kids when you’re working, or generally busy with after school clubs etc, can be exhausting. I like to cook the kids something healthy ish but something that is quick and won’t take hours to prepare or actually cook. Step in Birds Eye. 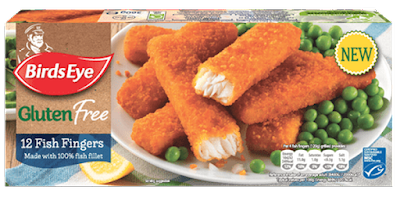 They’ve recently launched some tasty Gluten Free Fish Fingers to the market which are perfect to get the omega oils down the kids necks without a fight. I’m lucky enough to be able to work part time and it definitely benefits my family, but on the days I do work I have to travel and getting stuck in traffic is the difference between a freshly prepared meal and a ping meal. I always feel guilty about the ping meals though as I never feel they live up to much. I’m more reassured by the Birds Eye gluten free fish fingers however because it’s fish and full of good stuff. My son loves fish too so fish fingers are always a winner. I normally heat up some Birds Eye peas as well to get some greens in the little monsters. You get 12 fish fingers in a packet and I tend to put them all on to cook as Logan eats loads and any leftovers can be put into a sandwich. They only take 12-15 minutes to cook under the grill which is perfect when you’ve got some pretty hungry mouths to feed as soon as you step in the door. You can of course cook them in the oven but I feel they get just that little bit extra crispy under the grill. Whilst perusing the Birds Eye goodies I noticed they had a bag of frozen veg (carrots, broccoli, cauliflower, peas) so decided to give that a go to see how tasty it was. On the bag it said boil for 2 and a half minutes, and that's all it took to cook which was great. 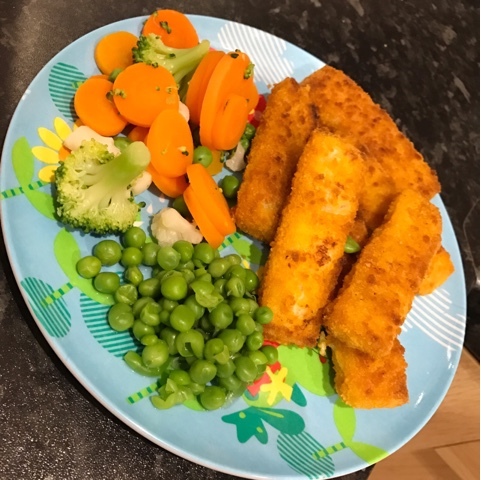 So what did we think of the actual fish fingers, peas and veg? Well the fish fingers went down a storm with everyone eating them up. Logan was even asking for seconds. I thought the peas were really tasty and so did the other half but the kids didn't touch them much. They're not massive pea fans though. The frozen veg was well received and it had actually kept most of it's freshness. I say most as the carrots were ok but I prefer cutting and cooking my own. Overall though a lovely quick healthy meal which everyone enjoyed and I wasn't running around like a headless chicken. Win win! I was sent some Birds Eye vouchers to purchase and write an honest review of these products. All opinions are my own. 0 comments on "Easy After School Dinner with Birds Eye"